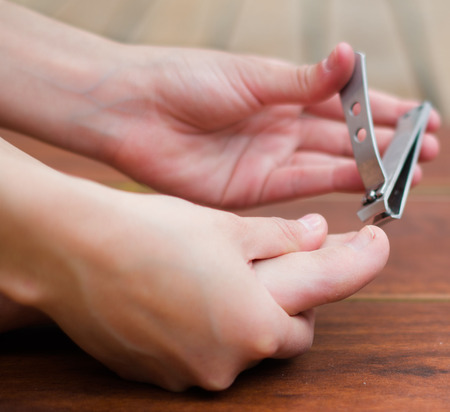 When your toes get pushed together and start to overlap, it can become very painful as they are forced into a bent position that can cause rubbing on top of each other and the inside of your shoes. This friction contributes to causing blisters and to the formation of corns and calluses. Overlapping toes need to be treated by your podiatrist to avoid future problems. Bunions—The bunion deformity pushes the big toe towards the other toes, and when it becomes severe enough, it can force the other toes to overlap with the big toe and with each other. Specially made orthotic inserts and braces can be worn to pull the big toe into a more straightened position. Tight fitting shoes—Wearing shoes that are too tight pushes the toes together and in many instances forces the toes to overlap or underlap. Avoid wearing high heels and wear shoes that have a wide toe box. Tendon imbalance—This is thought to be an inherited weakness in the tendons of the toes that causes them to become poorly supported and misaligned. Surgery may be needed to correct the imbalance. It’s very important to have overlapping toes corrected since they may cause you to alter the way you walk due to the discomfort. This altered gait can create pronation and arch problems that will radiate to your knees, hips, and back. If you have problems with under or overlapping toes, see your foot doctor for the proper diagnosis and treatment. At Family Foot & Ankle Clinic, Dr. Stephen Markantone treats a wide variety of foot and ankle conditions including sports injuries, diabetic foot issues, pediatric foot conditions, toe and foot deformities, fungal infections, and heel problems. Equipped with the most advanced technologies and a dedicated staff, Family Foot & Ankle Clinic provides individualized and high-quality care for patients in the North Versailles and Delmont, PA areas. Contact our North Versailles office at 412-824-9370 or our Delmont office at 724-733-3338 to schedule an appointment. The condition called clubfoot is a congenital deformity that occurs in nearly one out of every one thousand children. The condition is characterized by an inward turning of the ankle so that the bottom of one, or sometimes both feet are facing inwards. The condition can become chronic in later years if left uncorrected. In the vast majority of cases, clubfoot can be completely corrected and the child will experience no long term ill effects. The Ponseti method. This involves a combination of manipulation and stretching exercises using casting to gradually redirect the growth of the foot over a period of many months. This procedure works well because children’s bones and other tissues are still very flexible and easily redirected. Heel cord release and bracing. After the lengthy casting and manipulation procedure is completed, a small incision will be required to release the tightened heel cord. Braces are often required for some time to hold the foot in place and to prevent a recurrence. If these methods of manipulation, stretching and casting do not provide the necessary outcome, surgery will be necessary to realign the bones, ligaments and tendons. If your child is showing symptoms of clubfoot, be sure to schedule an appointment with your foot doctor for the proper treatment. At Family Foot & Ankle Clinic, Dr. Stephen Markantone treats a wide variety of foot and ankle conditions including sports injuries, diabetic foot issues, pediatric foot conditions, toe and foot deformities, fungal infections, and heel problems. Equipped with the most advanced technologies and a dedicated staff, Family Foot & Ankle Clinic provides individualized and high-quality care for patients in the North Versailles and Delmont, PA areas. Contact our North Versailles office at 412-824-9370 or our Delmont office at 724-733-3338 to schedule an appointment.